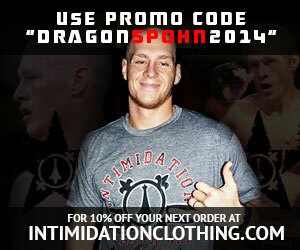 Intimidation Clothing is pleased to announce the release of their new “Iron Lion” Branden Hinkle signature shirt. A 3-time UFC veteran,”The Iron Lion” Branden Hinkle (16-11-1 MMA, 4-0 boxing) boasts notable wins over Jorge Rivera, Kevin Jordan and Sean Gannon at UFC 55. Hinkle was first sponsored by the Intimidation brand in his most recent MMA fight, in May 2012 in the main event of Reality Cage Combat which was the first MMA event ever held in Charleston, West Virginia. The “Iron Lion” has also signed autographs at the company’s booth for local fans and been sponsored at multiple boxing and MMA events while fighting, cornering and coaching. A pro since 1998, Hinkle has fought in Mexico, Japan, Korea, Brazil and France with just over half of his pro MMA fights on record coming in the USA. The former WEF Heavyweight Champion was a NCAA Division II National Wrestling Champion in college at West Liberty University, where he was inducted into the school’s Hall of Fame. Most recently, Hinkle improved to 4-0 as a professional boxer picking up his 4th KO/TKO win in as many bouts on July 3rd in Weirton, West Virginia. He continues to work as a coach for the wrestling team at West Liberty which is a NCAA Division II wrestling powerhouse. The “Iron Lion” Branden Hinkle signature shirt is a 100% cotton, 4.5 oz black tee featuring a custom medieval Iron Lion design on the front in silver ink with Branden’s name and signature on the back. All shirts are currently available on a pre-order basis with shipments expected to be made in September 2014. Intimidation Clothing is a fast-growing brand of MMA & boxing inspired lifestyle clothing & gear with a growing national presence and over 50 authorized dealers across the USA. Known as the biggest supporter of local MMA, the Intimidation brand is also regularly featured on multiple sporting events on SpikeTV, AXS TV, SportsTime Ohio, MTV2, FUEL TV, The Comcast Network, Comcast SportsNet and EpixHD as well as MMA highlight shows on Spike TV, AXS TV and more. In addition to over 110 styles of high-quality, bold t-shirts and sweatshirts for men, women and children and is also known for their premium-quality EliteFighter MMA board shorts. Anyone interested in becoming a dealer can apply to sell the Intimidation brand as a dealer and they can be found for sale online at IntimidationClothing.com. Fans can also follow the marketing wing of the Intimidation brand, Intimidation Interactive Media, @IntimidationIM, like Intimidation Clothing on Facebook or follow @IntimidationMMA on Twitter.